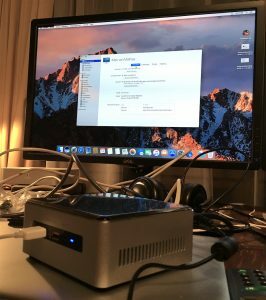 Last week I built a hackintosh server for macOS server. This machine replaces an old Intel Atom server running Ubuntu. For this project I bought an Intel NUC 6i3SYH with 8GB DDR4 ram and a Western Digital 256GB m2 SSD. The box version of the NUC allowed me to add another 2,5″ SATA disk for storage. For the Time Machine backup service I used external harddisks. 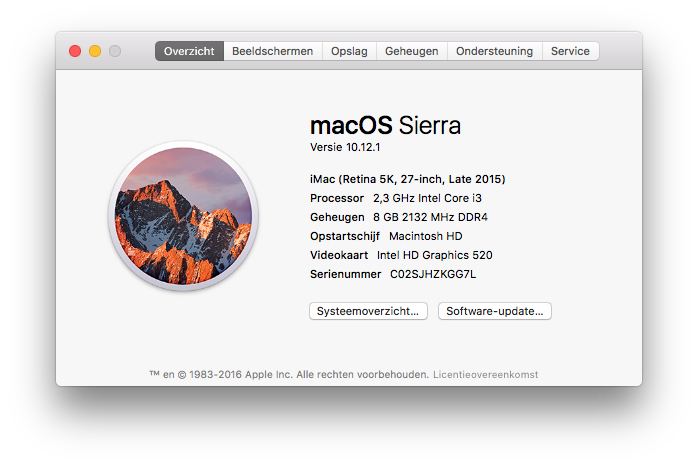 I downloaded the latest macOS Sierra from the Mac App Store and installed it using Unibeast and Clover. Once macOS was successfully installed, I could download the Server app from the App Store and configure everything on the machine. Don’t forget to disable auto sleep in the System preferences or your Mac will go in standby after a short period of inactivity. 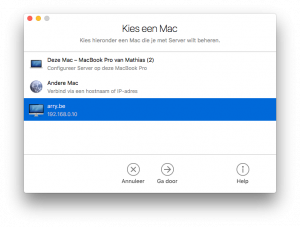 You can manage your headless Mac server with the Server app from another Mac. Just download de Server app on the other Mac and select the server. This will give you a nice interface from which you can manage your server. 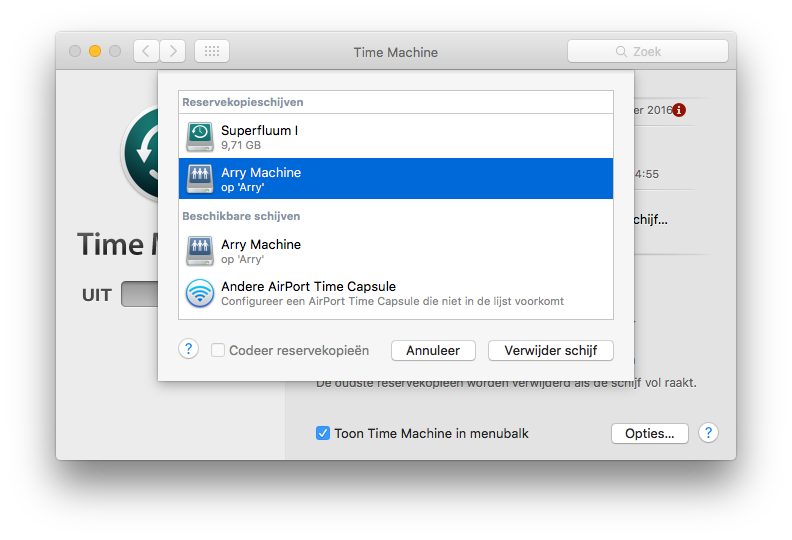 You can easily add a Time Machine volume in the server interface: Go to the Time Machine service in the left column. Then add a volume (set the correct permissions and limitations if you want) and enable Time Machine. 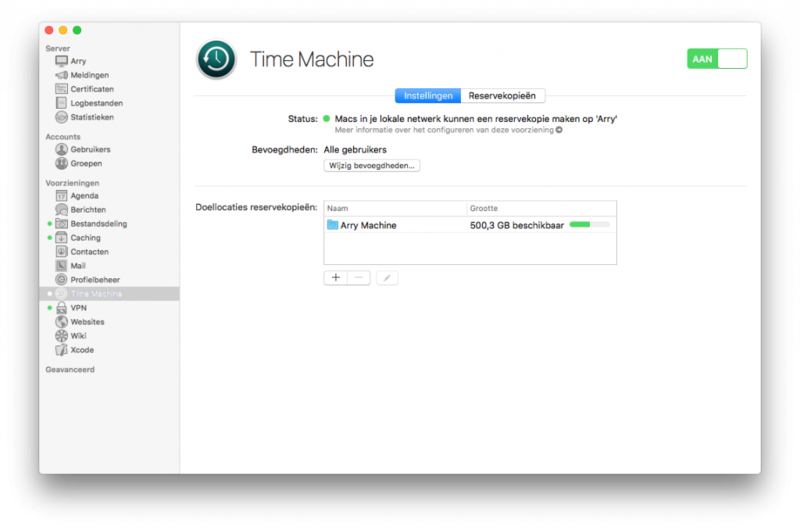 On your client Mac, go to Time Machine in the System Preferences, select Add backup disk and choose your new network volume. I had to restart my MacBook before the network drive showed up in the Time Machine settings. Configuring the VPN server can sometimes be a bit harder because you don’t always get relevant error messages when the client can’t connect to the server. I generated a new shared secret (make sure that it has the correct length, otherwise you might end up with useless error message). Then I choose IP addresses which are not in the range of the DHCP IP’s of my router. The DNS server are by default the same as your server, but you can add any reachable DNS server in there. You could e.g. use Google DNS (8.8.8.8 and 8.8.4.4). If you’ve configured everything, you can start the VPN server and connect to it with your Mac or iPhone. The VPN type you need to choose is L2TP. I had unfortunately no luck yet configuring the Caching server. Everywhere on the internet I read it’s a piece of cake: just enable the service and it should work. 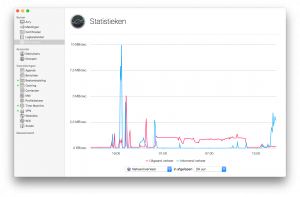 Well… my clients aren’t downloading through the caching server ?. The second part contains all the ‘expert’ ? configuration I did, i.e. anything which isn’t provided through the Server app config panel. Then restart the SSH (or Remote login as Apple calls it) service. Download MacPorts from the official website. And install it. $ youtube-dl -f "[ext=mp4]" "https://www.youtube.com/watch?v=BzqjhC2OYnM"
Don’t forget to run iTunes as a login item. 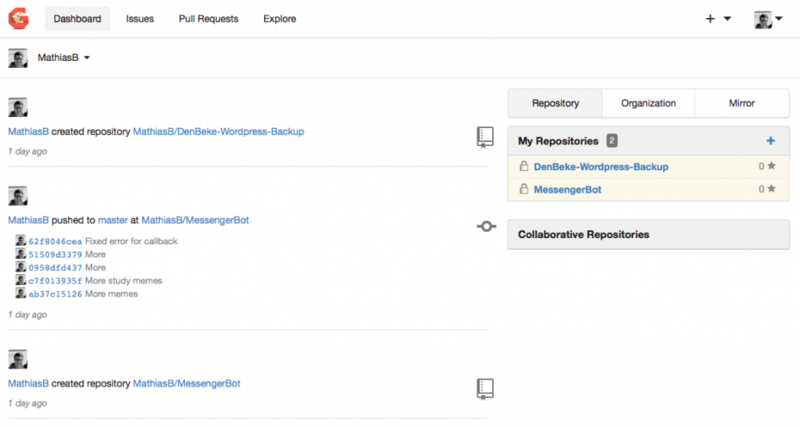 To host my git repositories I run Gogs on my Mac. 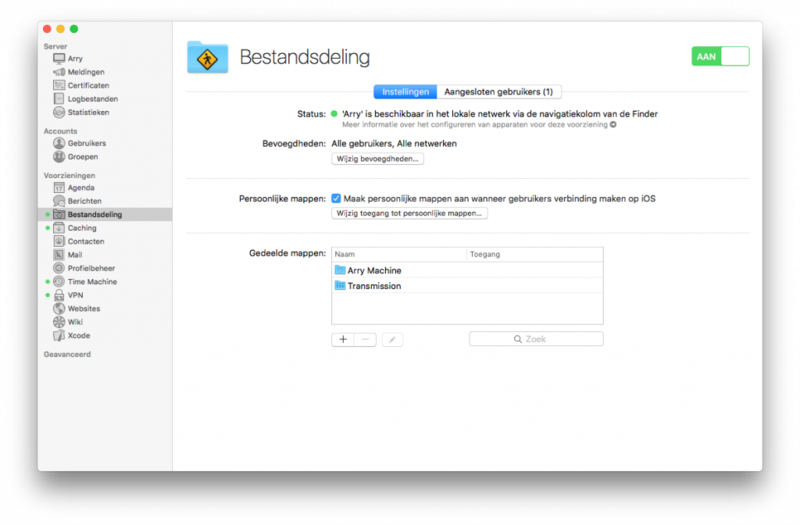 More info in this blogpost: Running Gogs (Go Git Service) as a service on macOS X server.